The defense of the Metropolitan Riveters Isobel Cup championship hasn’t gone exactly as planned this season. I know, I know; thank you captain obvious. It started off with some confusion as they didn’t name the successor to head coach Chad Wiseman until September 20 when they hired Randy Velischek to become the franchise’s second bench boss. They played their first game nine days and a handful of practices later, an exhibition on Sept. 29 against the champions of the SDHL in the first-ever Champions Cup. Luleå Hockey bested the NWHL champions 4-2 in the match and it seems like ever since then the Riveters have been stuck in quicksand. Is Velischek’s lack of understanding of his team’s strengths and weaknesses holding them back? Perhaps. Some of his lineup decisions and choices haven’t worked out at all, but this is still a team that is returning fifteen players from its championship team and they added an Olympic gold medalist who is familiar with many of the Riveters from playing alongside them two seasons ago. “We have to right the ship a little bit here, but I have full faith with the group that we have that we’ll be okay,” said captain Shelly Picard. Below we’ll try to sift through all that has gone on over the first ten games of their season as the Rivs find themselves in the NWHL’s basement with a 2-8-0 record. On the plus side, they don’t have to play any more games in 2018. Their next game comes after we flip the calendar to 2019 when they look to even their season series with the Connecticut Whale at two games apiece. The schedule maker wasn’t kind to the Rivs and with a new coach at the helm, it was a recipe for disaster. They played six games over the first 21 days of the season, including two sets of back-to-back games against the Minnesota Whitecaps in the span of 15 days. At the holiday break, the Riveters have played ten games; the Whitecaps and Boston Pride have only played eight, while the Buffalo Beauts and the Whale have played just seven apiece. On the plus side, they have six games left spread out over the next three months. Four of the remaining six games are against Buffalo, a team that the Riveters have had some memorable battles with over the past three seasons. Perhaps the Beauts will bring the best out of a team that has been struggling to find its identity over the past two and a half months. “I think we showed improvement as a whole team today and that’s going to tell the tale for the rest of the season,” said Alexa Gruschow following the Riveters final game of 2018, a 5-2 home loss against Boston. “We just have to get (another) win up there. We’re playing hard, starting to get back to playing our game, and the wins will come. 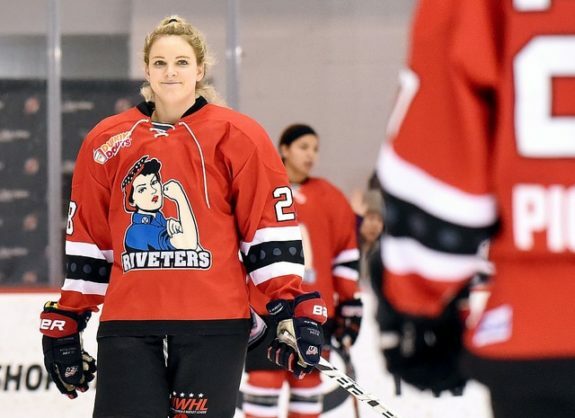 Definitely going into this new year I think we’re going to see different Riveters hockey than we’ve seen in the first half of the season,” she added. It is believed that each of the five teams in the league will make the playoffs and that is good news for the Rivs. It’s our understanding that the fourth and fifth place teams will square off in a neutral site to determine which team will play the league’s top seed. If they get hot at the right time, with the experience they have, they could make a run and become the first team in league history to win back-to-back titles. If they finish fourth or fifth, which seems like their destiny at this point in time, they will have to win three straight games (on the road) to repeat. If they somehow finish in third place, they would only need to win two playoff games. One of their best players from last season, Miye D’Oench, is now back on the ice with her teammates. She played in their last three games and has three points (all assists) after missing the first seven games while working on a congressional campaign in Kentucky. 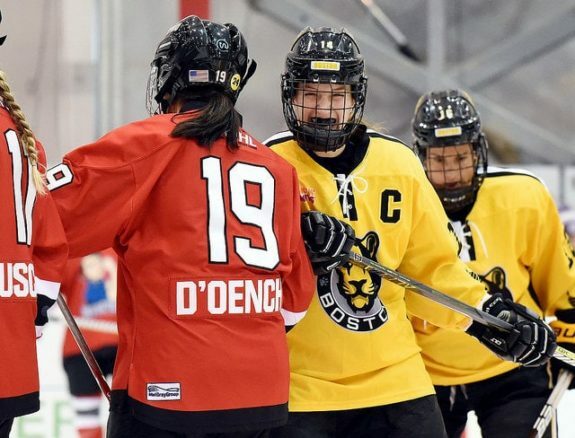 Last season D’Oench and Alexa Gruschow were a dynamic duo for the Riveters and gave them a 1-2 scoring punch until D’Oench was injured in January. 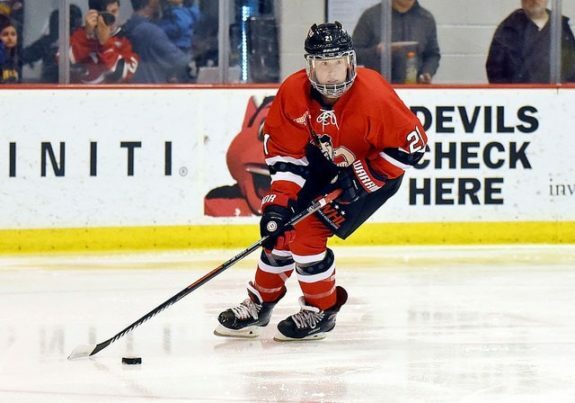 One of the biggest cause for concerns this season for the Riveters has been their sputtering power play that has looked anything but powerful this season. During their championship season, they tallied 20 power play goals (in 78 tries) over the 16 regular season games. Through this season’s first ten games they have a mere two goals with the extra skater in 37 power plays. To make it more of a sore spot, they’ve surrendered at least one shorthanded goal (four total) to each of the three teams they’ve played this season (Minnesota has two). Boston is the only other team that has given up a shorthanded goal this season. Some of the Rivs most talented scorers (Amanda Kessel, Packer, Rebecca Russo, Courtney Burke, Kelsey Koelzer, and Gruschow) have combined for zero power play goals. The only two players on the team with power-play goals are both defenders – Jenny Ryan and Chelsea Ziadie. On the plus side, Kessel does have an assist on each of her team’s PPGs and is one of only three players in the league with more than one helper on the power play. And the Rivs have one more power-play goal than the Whitecaps, who have one in eight games. The penalty kill hasn’t been bad, killing off 24 of the 28 power plays against and they do have a shorthanded goal courtesy of Gruschow (which came in their last game). But at 85.7% on the PK they are last among the five teams. Connecticut and Buffalo have each only surrendered one power-play goal and sit at 96% and 95% respectively. Here are the good stats. Rookie forward Audra Richards is tied with five other players for the NWHL lead with six goals. She has been a great addition to the team at both ends of the ice and it’s scary to think where the Riveters offense would be without her. Kessel is tied with three others for the league lead in assists with seven. The gold medalist has a team-leading eight points, collecting a point on just under half of their 17 total goals. Russo is second in the league with 37 shots on goal. She has at least two shots on goal in every game thus far, highlighted by nine in her two-goal game at Boston. Gruschow has won the second-most face-offs in the league with 94 and since the end of the ‘six games in 21 days’ she has looked more like the player that won the NWHL MVP last season. Here are the bad stats. Last season’s playoff MVP Katie Fitzgerald has only one win in eight starts. After giving up 28 goals in 15 games last season, she has already surrendered 28 goals this season. Koelzer was co-MVP (4 goals) of last season’s All-Star Game and finished with 14 points (5g-9a) in 15 regular season games. She was injured during their game on November 25 and had zero points in the eight games she has played in. Kelly Nash has only played three games and has zero points. Burke, the winner of last season’s Defender of the Year, has only two assists, but was injured in the first period of the Rivs second game of the season and missed the next five games. Erika Lawler has only one point (assist) and four shots on goal in eight games. Aside from the game in Pittsburgh against the Whale (15), she hasn’t taken more than eight face-offs in a game; last season in 14 games she took a total of 248 face-offs. Kristin Lewicki joined the Rivs after a season with Buffalo and is still searching for her first point in red after ten games, and she hasn’t taken a face-off since October. Last season with the Beauts she had five goals (seven points) and took 130 face-offs. 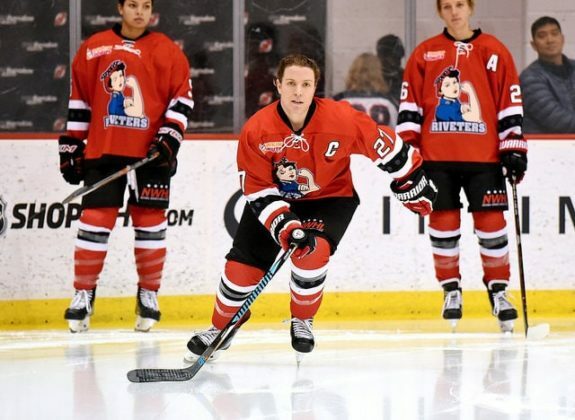 Despite all of the trials and tribulations that they have endured through the first part of the 2018-19 season, the Riveters haven’t given up. They’re still working hard and following their ridiculous October schedule they’ve been in just about every game. They’ve certainly earned the respect of their opponents from week-to-week. The Whitecaps swept the Riveters twice, once in Minnesota and once in New Jersey in the span of 20 days and if you just look at the scores it wasn’t really close. But stats don’t always tell the full story. “The Riveters are a great team and to walk away with four wins is incredible. It wasn’t like any of them were easy,” said Whitecaps forward Allie Thunstrom after completing the second sweep. 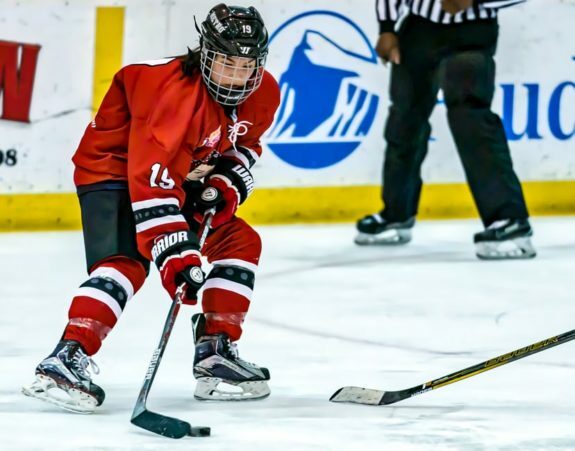 The hope from their fanbase is that the Riveters will come out of the extended break with a reinvigorated group that is fresh and firing on all cylinders as they prepare for the final segment of the 2018-19 season.